NEW YORK, New York — There is no better way to start the week than with the promise of recreation. On August 9, the Armenia Fund invited residents of the Armenian city of Spitak in the Lori Region to behold the Daniel Sahakyan No.2 School’s brand new gymnasium, soon to be eagerly inaugurated by the school’s 300 students when the academic year commences in a few short weeks. 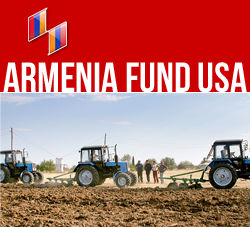 This project comes a decade after a 2000 initiative sponsored by Armenia Fund’s French affiliate in which a wing was added to the No. 2 School. Faculty, students, and their parents came out for the playful opening ceremony, also attended by a delegation from Hope for Armenia led by Rev. Rene Levonian, president of the Evangelical Church of Armenia. Other guests included Lori Governor Aram Kocharyan, Spitak Mayor Gagik Sahakyan, Marseille Mayor Jean-Claude Gaudin, and Hayastan All-Armenian Fund Executive Director Ara Vardanyan, the latter two distinguished attendees sharing the honor of cutting the red ribbon. Also delivering remarks and conveying their thanks were Governor Aram Kocharyan, Mayor Gagik Sahakyan, and Rev. Rene Levonyan.